It's raining pretty steadily today, but I decided to go to the lower falls (Kaaterskill Clove) and see what I could get done. It worked pretty well, I just set up my new huge plein air umbrella and worked under that for about 3 1/2 hours. With my ipod playing and my raincoat keeping me dry it was even cosy! Benefits of rain: no mosquitoes and no tourists. That and the wet rocks look so pretty and shiny! I just did an underpainting today. This was all on the advice of a fellow painter here, who says he does a thin color underpainting using the oil paint thinned to the consistency of ink or watercolor. Above I started with a line drawing to block-in the layout using a small round synthetic brush, and a paper towel corner dipped in turp for an eraser. Above I used the burnt umber thinned with turp to lay in the basic lights and darks. For the underpainting I used turp-thinned paint and kept the values light and the colors reddish. Everything is just a tint. This is the underpainting as it stands so far. My plan is to continue working on it for a couple more sessions and see how far I can develop the painting in on-site. You might recognise this as the same boulder I drew back on Day 2. Yesterday evening we went out to do another sunset study. This one again suffers from being too light. Not sure I'm cut out for the lightening-speed approach this requires to capture the hues, values and chroma. 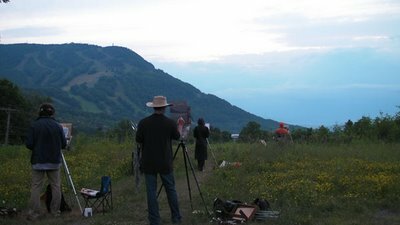 Here's a shot of several of my fellow painters finishing up their studies just after the sun has set. That's Hunter Mountain beyond us, you can see the cut trees from the winter ski trails. Nice work so far! I am not sure if Jacob has given the Munsell lecture yet but it might be worth trying to premix your colors for the sunset studies. Of course you'll have to adjust the color but at least you'll start with something very close. Say hello to everyone for me. Keep warm and stay dry! Hi Julie! Good suggestion, I've been pre-mixing colors for my other studies, but I never feel like I have time to do it for the sunsets. Like anything though, it's all about slowing down and taking the time to look. I have to learn to do that without getting frantic over the fact that everything in a sunset is constantly moving! It's actually warming up, I wasn't freezing at the Clove today for the first time!